Sage 200c: Data Entry Wins - Getting data into Sage quickly! 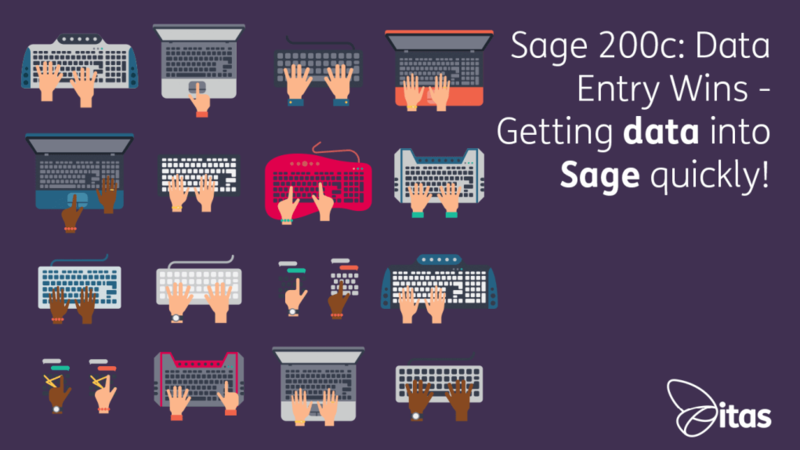 Sage 200c: Data Entry Wins – Getting data into Sage quickly! Data entry can be one of the most time consuming and frustrating elements of your daily role. Whether its the time taken to key into your system, cross-referencing data or validating records these can all add up to serious chunks of time in your day. But don’t fret, there are some great solutions designed to help. Sage has some standards solutions designed for importing data into Sage 200 to help you save time using template CSV import files. You can import a variety of information for sales, purchase and nominal ledgers, stock control, price book, purchase order processing, project accounting, bill of materials and manufacturing modules. You can find Sage Import files by selecting F1 within Sage to open the Help Files. Then type imports into the search and navigate to the file you require. Each import type has a CSV template and an excel file. The excel file guides you on the data requirements when completing the template. If you are still struggling, you can always contact our support team and we will be happy to provide you the files directly or to help you identify and understand the import file you require. However, here are our top tips on getting it right! When your working with CSV import files it’s important to remember some basic rules. Most users will find it easiest to input or manipulate data by opening the CSV file in Excel. Save the import file to a location on your machine and open by browsing to the file location through excel. Don’t forget when saving to keep it as a CSV file format. Otherwise, it won’t be recognised! Your first line (top row) of the CSV file must always include the column headings. This row is known as your file header and specifies the fields (identifiers) in the import file. You will always see this pre-populated in the example CSV files. Each record you enter must start on a new line (or row). You can edit your file in notepad or similar but make sure each new value is separated from the next by a comma. Not all fields in your import file will be mandatory but you must not change the order of the fields. You can leave optional fields blank but don’t delete the field heading or column. Top tips on troubleshooting CSV imports! Check mandatory fields are not left blank. The data you enter must match the requirements stated in the excel guide. Watch out for things like field lengths and changing formats. Check text fields do not contain commas within the data to be uploaded. CSV files read commas as the start of new columns so will try to change the format of the file when importing and generate errors. Check for blank values in front of numbers these will usually be visible but you can use formatting formulas like TRIM in excel to remove. Remember not to leave any formulas in your CSV template. Market research conducted by Sage indicates that 98% of Finance Professionals use Excel on a daily basis. To take advantage of this fact we offer one of the best add-on products in the market to maximise your Sage 200 efficiency. Excelerator offers the flexibility of excel with the business logic and data control of Sage. From a single click of your mouse, data will be validated and updated to Sage 200 with absolute accuracy and efficiency, cutting data processing costs by up to 50%. Within Excelerator you can use supplied templates or define your own templates to manipulate data across a number of modules. You can embed templates within existing sheets to mine data out of your standard views. Excelerator allows the flexibility of excel using all your standard formulas to create your data and there is no need to convert formats or remove formulas to import. You can search across data fields and pull in data from different tabs or sheets. Excelerator uses all the control of Sage data rules in your templates when populating data and importing data. If it’s not allowed in Sage its not allowed in Excelerator. Excelerator enhances error resolution by providing meaningful error messages and there are validation options to highlight where errors exist. If you would be interested in a demo to show you the possibilities and flexibility of Excelerator please get in touch and we’ll be happy to arrange. Don’t forget you can register on our site for handy blogs and for access to our free guides which include importing data. We’d love to know what blogs you might find useful so drop us a note! Home » Sage Blog » All Sage Blog Posts » Sage 200c: Data Entry Wins – Getting data into Sage quickly!